If you have questions, would like more information, or want to share your thoughts, please fill out the blanks below. "Now to Him who is able to do exceedingly abundantly more than we can ask or even imagine according to His power that is at work within us, to Him be the glory in Christ Jesus and the church, both now and forevermore! Amen." I think the best way to understand how this book might impact you is to find out how it has impacted others. Please have a look at what these spiritual leaders think.. Also, I have included a link below to download the first chapter of Glimpses. When you are ready to purchase click HERE. 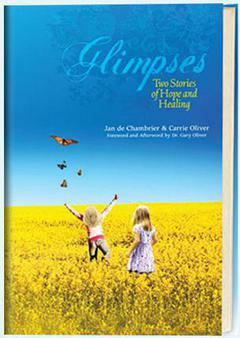 Jan de Chambrier's book, Glimpses, is both captivating and endearing. Jan's story resonates with the journal entries of her friend,Carrie Oliver, as she shares her personal journey with cancer. Her writing is honest, sincere, and inspiring. The character of a life fully devoted to God flows gently and tenderly from the pages of this book, engaging the reader with both spiritual truth and a heartfelt compassion for those who endure the rigors of surviving cancer. The story Jan presents is personal, but also profoundly reflective of the journey many cancer survivors experience. Her words offer a calm reassurance that cancer need not be the end of hope but can be the beginning of a new season of faith and a new opportunity to embrace all that is dear to us. The journey of two friends may end very differently, but they share the same destiny. At God's final Amen, we shall see the face of a loving God and our healing will indeed be complete. Jan's story will motivate readers to face life with determination and courage. If you would rather mail a check please provide the information below and we will send you mailing instructions. This is an incredibly realistic book of faith and hope. The journey of these two women through cancer and with the Lord must be available to the millions of those in our country struggling with this disease. Having lost my wife of forty-eight years to cancer, I can attest to the fact that this is an honest portrayal of this difficult journey. I knew Carrie all of her married life and performed the wedding ceremony for Gary and Carrie. I have seen and felt their pain and joys during their journey. I know their story will bless many lives. Rarely does one come across a book that speaks with the truth and reality of life while unfolding a deep love relationship with the Lord. But this book DID IT! Never having any major health challenges, I felt through these two amazing women the compassion, understanding and connection with our Savior in their passion for healing and love of Him. This book shows that other things are truly unimportant. As you read Glimpses you will come face-to-face with the teaching of two women: One through her final journey until she saw Jesus face-to-face, and one through her journey of illness and healing. There is a beauty in the intricacy of the 'tapestry' that God has woven through their stories. I know you will be struck through your reading more with Jesus than with either Jan or Carrie. This is a book worthy of adding to your library of spiritual formation.